These paintings depict two women who are very close to my heart. Nakai Breen was a Cherokee medicine woman who lived in southern Texas and devoted her life to healing people and promoting planetary equilibrium. 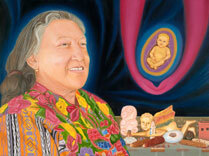 Grandmother Flordemayo is a Mayan Cuandera Espiritu, or healer of the divine spirit and founding member of the International Council of Thirteen Indigenous Grandmothers.